Go visit Harriet at Hey Harriet for other participants. Incredible shaping of light cast on the plain of shadow! Beautiful shot! 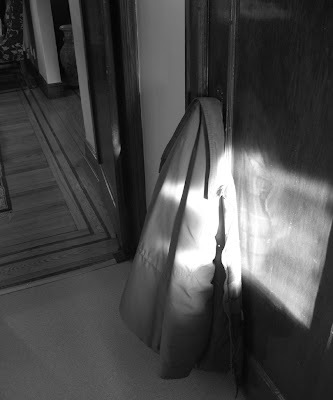 Very nice shot of the sun/shadow on the jacket. This one is fascinating. At first glance you aren't sure what the object is except that it is intriguing. Very Well Done. That's a great Twilight Zone effect on that one! Well, I just wanted you to know that I passed on the Christmas Spirit award to you today. Come by when you can and pick it up if you'd like. Cool! I love those patches of sun we are so fortune to witness sometimes.